Scheduled for a Sunday afternoon, King of the Cage “Starbound II” will be live inside the Santa Ana Star Center tomorrow, December 2nd. As is the case when KOTC comes around, the card is packed with local talent and intriguing match-ups. 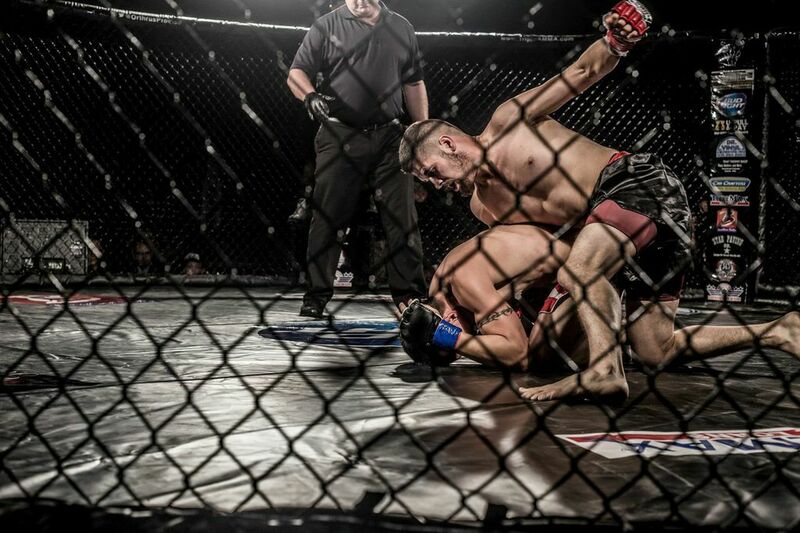 Mainstays in the New Mexico regional combat sport’s circuit, the Perez brothers of Belen have made their mark in both boxing and mixed martial arts over the years. For Derek Perez, he added a third type of combat to his resume only a few months ago. Back in June, Derek Perez competed for Bare Knuckle Fight Club and outlasted opponent Edison Charlie en route to a referee stoppage in the fourth round due to Charlie’s dislocated shoulder. The bout was brutal and showcased the gritty toughness that the Perez brothers are known for. The win would award Derek the promotion’s title as well as the success story that comes with it. Ever the competitor, Derek didn’t sit around enjoying the victory. Instead, he would go on to compete three times in boxing and once in mixed martial arts, not including his scheduled bout for tomorrow night against Nikko Nathan. Derek has gone 2-1 in his most recent boxing run that including taking short notice (one of which was a day’s notice) fights against Rondale Hubbert in Dallas, Texas and Marty Gutierrez in Robstown, Texas. Both opponents were heavy favorites heading into those bouts and Gutierrez was actually undefeated prior to meeting up with Perez. Though Derek’s records in boxing and MMA may not impress some, this is a case where taking deeper looks into the resume really changes the narrative. At 2-7 in MMA, and 3-9-1 in boxing, Perez has only competed against top talent. Rarely, if ever, has Perez fought someone not on a winning streak and/or with a winning record. Durable and tough as they come, Derek really encompasses the passion of a true fighter. Derek’s brother Gene, the lighter of the two combat athletes possesses the same gritty resume as Gene has taken on some of the best up-and-coming boxers throughout his time in the squared circle and though he sits at 2-15-1 as a professional boxer, his opponent’s combined records at the time of fighting Gene stands at 74-32-8 and in the ranks of MMA, Gene is looking to get to that .500 mark and come out from under the upside down record. Gene is 8-9 in MMA while dipping into the Flyweight and Bantamweight weight classes. The lighter of the Perez brothers, Gene will take on submission specialist Joshua “The Destroya” Montoya on Sunday afternoon. The Perez duo is constantly active throughout the region fighting for several promotions and proving to always be a tough out for any opponent. On Sunday afternoon, Derek will tussle with a name that seems to be gaining some momentum in the fight scene, Nikko Nathan. Though he lost his professional debut, Nathan showed impressive talents in his amateur campaign. With most of his fights seeing the judge’s scorecards, Nathan is also well-known for his toughness and that alone will make the bout with Derek Perez one to keep an eye on Saturday night as potentially the “Fight of the Night”. Gene Perez will meet up with another experienced, veteran of combat sports in Joshua “The Destroya” Montoya, how himself has tangled in both boxing and mixed martial arts. The match-up will be a stylistic clash as Gene brings a striking-heavy arsenal to the cage while Montoya has been noted for his submission chops throughout his career as a fighter and grappler. The contrast follows each fighter in their records as Montoya has struggled in the past versus strikers where Perez has typically tasted defeat via submission. The fight should come down to which fighter is able to impose their desired game plan as Gene will undoubtedly look to implement a boxing-eque offense while avoiding the wrestling and smothering top game of Montoya. Live on Sunday afternoon, December 1st – King of the Cage will look to bring an exciting show to Santa Ana Star Center. Regardless of outcomes on Sunday afternoon, the Perez brothers represent an essential aspect of the regional combat circuit. They have fought the “who’s who” of their respective weight class over the years and neither have ever shy’d away from saving a fight card by taking fights on short notice. They may not get the respect they always deserve because of their deceiving records but make no mistake, the Perez brothers come to entertain the crowds and do so by leaving it all in whatever venue they bring their talents into on any given night. 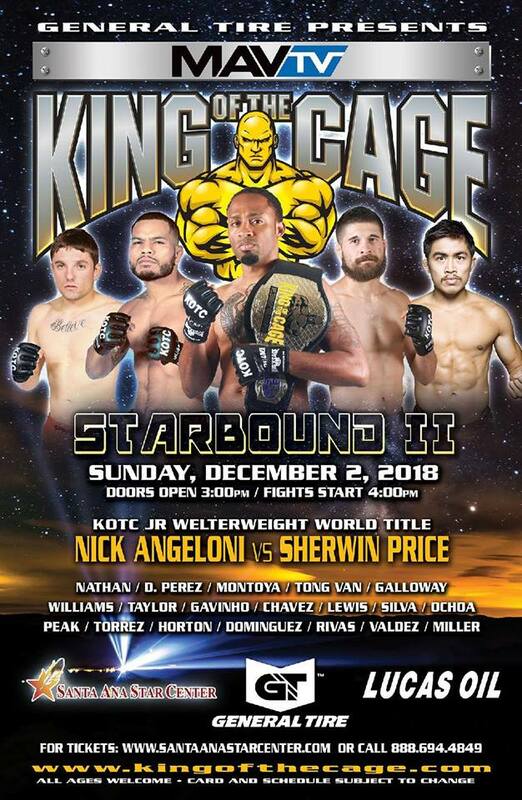 End your weekend with local mixed martial arts as King of the Cage presents Starbound II on Sunday afternoon with the first fight scheduled to begin at 4:00pm.